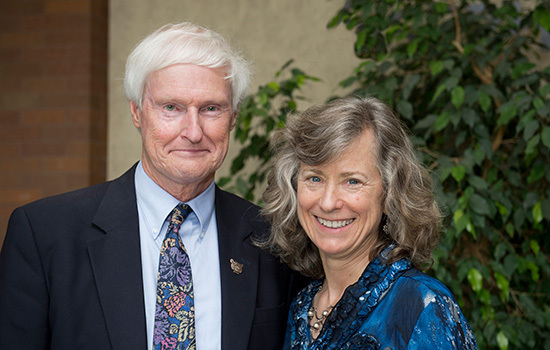 RIT President Bill Destler will share the stage with his spouse, vocalist Rebecca Johnson, as they perform a medley of American songs at 2 p.m. Saturday, Sept. 27, at the Little Theatre I as part of the 2014 First Niagara Rochester Fringe Festival. RIT President Bill Destler on the banjo, accompanied by his spouse, vocalist Rebecca Johnson, are part of the “Fringe benefits” as Rochester Institute of Technology joins artistic forces with a variety of businesses and cultural organizations for the 2014 First Niagara Rochester Fringe Festival. The Destler/Johnson duo will perform 2–2:30 p.m. Saturday, Sept. 27, at the Little Theatre 1. They join more than 380 eclectic performances during the 10-day festival event Sept. 18–27 in downtown Rochester’s East End. A sponsor of the Fringe Festival, RIT is renowned for combining technology and innovation with its strong artistic community—which will come to life with more than 20 performances in a mix of poetry readings, dance, film, theater, music, gaming and visual arts. All events are free and will be held at the following venues: Gallery r, 100 College Ave.; Little Theatre 1 and the Little Café, 240 East Ave.
“Rochester is a festival town,” said Zerbe Sodervick, Gallery r director for RIT’s College of Imaging Arts and Sciences. “People get excited about the arts, and for people who build it into their busy schedules, there’s a huge reward. The Fringe Festival downtown lineup includes Canada’s Circus Orange, comedy/celebrity impressionist Jay Pharoah of Saturday Night Live, Mardi Gras! By Cirque du Fringe, Silent Disco and its new lunchtime version, Brown Bag Disco, and Method Machine’s Spoon River Rochester, where 300 performers portray the “living dead” of Edgar Lee Masters’ anthology (1915) Spoon River. For a schedule of RIT Fringe events, go to www.rit.edu/fringefest. Or contact RIT Director of Special Events, Lynn Rowoth, at 585-475-7408 or lynn.rowoth@rit.edu.